This is cathegory for cats and kittens in Australiawhere you can find cats and kittens for sale in Australia,diffrent cats and kittens in this Australia,colour and breed. Cats for sale, kittens for sale ads in Australia. Thank you for visiting our free advertising website Cats for sale, kittens for sale, Australia section. We provide high response free classifieds and free advertisement. Use our online free Cats for sale, kittens for sale classifieds placement system to find, list, offer Cats for sale, kittens for sale online! I sell bengal boy from Litter A from perfect parents : IC Uggo Marmoll, mather: CH Klippeneck Wild Luzie. Kitten is after first show, full vaccination, chipping, he likes animals and people :) He has so perfect body from his father, good cotrast, nice rosseten, nice profile. All informations: www.bengalska-plzen. Male British shorthair kitten, 4 months old he comes, Desexed Microchipped 2nd Vaccination Wormed Flea treated Litter trained Vet checked MUST SELL REDUCED PRICE $200.00 Well socialised with other cats and has grown up around older children. Very healthy, active and affectionate kitten. Rags2riches Ragdoll Cats has available for sale a litter of lilac bi- colour kittens. Both male and female available now. Kittens come vet checked, vaccinated, microchipped, desexed, wormed, litter trained, well socialised and with pedigree papers. Cost $750. We are happy to organise freight for interstate buyers at purchasers cost. Bengal x kittens available now to loving homes only, three female and one male kitten.these kittens are very Bengal in nature that is to say they are extremely playful, adventurous and love playing in water, very intelligent and very well developed most are showing signs of developing the rosettes in their coat so prized by Bengal lovers. they need good home and we are going to give them to some one who will take good care of me, so please do contact for more information. F2 Savannah/Bobcat Kittens good looking F2 Savannah/bobcat hybrid kittens two males and two females . All kittens have big paws and big ears with black tuffs.They will get quite big. Sweet and playful personality's. health certificates..
New litters by GC Boberan Lucky Strike of Vonn-Bliss(many times best allbreed in his short career to granding). one litter out of Barmont blue cream girl by his national winner Breathless-red factors and a blk. tortie and sloid red girl reserved for show 2nd litter Boberan/Midas 2 campaign quality blk smokes and 2 red smokes-one a poss cream-one top quality. We have 1 desexed sphynx blue tabby male, he is a Gen 1 registered with Warratah National, he is vaccinated wormed ad as said before desexed, his reduced price is now only $1100, he is ready to go to his new loving home he is 17 weeks old, he has 6 weeks free pet insurance, freight is available at. This little girl is the sweetest little angel, As you can see she is cute and cuddly. She just melts into your arms and would stay all day. We have lovingly raised her and she has been throughly check out by our vet. she is already trained to use the puppy pad!! She is perfect in every way and ready to find her forever family. 2 Domestic Short Haired kittens (1M (Mandu) & 1F (Aster)) free to good home. 16weeks, well trained, extremely affectionate and curious. Very tolerant with people. Vaccinated and wormed & flea treated Call Merel on 04 3769 6264. Two female ragdoll kittens for sale multicolor tabbies both very friendly and playful comes defleaded and toilet trained. Located in altona meadows..
MY Persian CAT max is A BABY WITH A PRETTY FACE . he loves kids and other pets . he is healthy with all documents available .i need a home and family for him . contact us for more information about him. a cute and loving kitten to give awat to a loving family , she is very friendly with people especially children, she has undergoes certain tests and she is free from all diseases.for more info please contact..
Beautiful friendly green eyed 7 year old cat to give away to a good home. Desexed, microchipped and all injections up to date. Cat cage and cat bed can go with her. Also have her papers. Owner moving overseas. If interested you can e-mail me at melaniesm3@bigpond.com for further info..
Westminster Brits still has some female & male kittens available. The gorgeous little bundles of fluffy joy will be ready to enter your home on the 4th & 22nd of February 2011. Kittens come house trained, with their first 2 needles, desexed and a kitten starter pack. Registered breeder with NSWCFA. Five Beautiful Kittens 3girls, 2 Boys, Lovely natures, Pretty Makings, Defanatly Worth Having a look at. Ph 41543796 Bundaberg West. This adorable puppy was born on sept 1 2010. She is now more than 4 month but she only weighs no more than 2 lbs. Her full grown size would be 3 ~ 3.5 lbs. Her 4 vaccines are done already and her dewormings are all up to date. She is registered as CKC sajivarmama@yahoo.com. -BECKATT BENGALS SPECIAL KITTENS NEW IMPORTED BLOOD LINES AVALIBLE -we have quality, brown, silver and snow leopards babies, (some not yet on our site) starting to rosetted (and the marbled are starting to open up)with clear coats and extremely strong markings, very glittered and wild/leopard looking heads(have a look at our kitten page) extremely loving being raised in our home with our 4 kids and our family environment. All of our kittens deserve good homes, so if you are a cat lover, please consider adopting one. They are all completely tame, good natured, house trained and desexed, are healthy and have received regular worm and flea treatments. They are real "smoochers" and get on well with other cats and dogs. 1 x Chocolate point male green eyes 6 months old Name: Lynx Very playful, loving cuddly, 1 x Lilac point female green eyes 12 months old Name: Venus Very loving and calm placid & cuddly These are both INDOOR cats due to their rag doll nature - they have not had a litter yet as male is under age. We have several kittens available for the holiday season including a snow female, one rare, longhair female, and one male and one female brown spotted. Prices vary. inquire for more information..
we have available exotic kittens for sale . all our kittens are well tame all vet check and come to you with all documents . we have male and female serval kittens savananh f1 and caracal kittens for sale to serious family . our kittens are raise in our home with our children s . if you love to buy one of this ktitens , please email us now for more details . Indie is a 6 month old domestic long hair, we found her at 4 months old but are unable to house her due to other pets. She has been desexed and had had all her shots. She comes with litterbox, scratchy pole and a few toys. 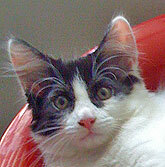 She is an active and affectionate kitten who loves to explore, she is litter trained. There are 6 beautiful kittens that we are willing to give away to anybody with a good home. If you would like any specific information, details or photographs of the kitttens feel free to contact me, i am willing to get back to your enquiries as soon as possiable. THanks, Natalie. I have 2 male cats a year old to give away. They are brothers so would prefer them to go together if possible. Both are desexed and have had vaccinations. They are both people friendly cats and have grown up around children. One cat is pure white and the other is black and white. These cats really are gorgeous and we are needing to find them a good family home due to constant traveling of my family. 5 kittens left from a litter of 7. These beautiful babies are ready for a new home as of this week. All grey some fluffy and some short haired, 2 males and 3 females. Green, hazel, blue eyed. Litter trained and eating solid food both canned and biscuits. Looking for a loving home just in time for christmas. Indi is a stunning ginger and white 6 month old kitten. We are moving to a small apartment so we unfortunately have to find her a new loving home. She is an inside kitten that would suit someone looking for companionship. Indi is desexed, vaccinated, wormed, micro chipped and registered. She is toilet. Hi, i have four kittens they are about 8 weeks old. Colors are white/tabby and white/gray they are very cute. Free to good homes, Sunshine/Ardeer 3020/3022 area. Email with any questions. Thank you. GIVE AWAY! To VERY good home! 7yo, female, tabby cat. Very friendly and affectionate, very loving. Wonderful manners and house trained. Would make a great pet for any household!. Australia free ads for Cats for sale, kittens for sale, Australia, Cats for sale, kittens for sale free ads Australia, Cats for sale, kittens for sale for sale Australia, Cats for sale, kittens for sale to buy in Australia. Find on this page free classifieds for Cats for sale, kittens for sale in Australia. This listing includes classifieds for sale and to buy in Australia. FREEADSAustralia Australia offers you a platform to post free advertisements or classifieds for Cats for sale, kittens for sale in Australia. FREEADSAustralia helps you search, find buy, sell, rent or hire in various categories like apartments, goods for sale, local services, cars , jobs and many more in Australia. If you posted an advertisement in category Cats for sale, kittens for sale of FREEADSAustralia Australia before please use Edit my ads button to change or cancel your ad. Cats for sale, kittens for sale Australia ads Australia, Cats for sale, kittens for sale classifieds Australia, Cats for sale, kittens for sale free ads Australia, ads for sale Australia, ads to buy Australia, FREEADSAustralia Page number 4-1. Find here ads for sale, to buy and rent in Australia. Goods for sale in Australia, vehicles for sale in Australia, Australia real estate for sale, Australia property for sale, property for rent in Australia, business ads in Australia, Australia business classifieds, services in Australia, Australia services ads, jobs in Australia, pets for sale in Australia, Australia dating, Australia cars for sale.